What is a Scratch Extension? The latest Raspbian image (2018-10-09) as of this writing, includes an offline version of the Scratch 2 editor. 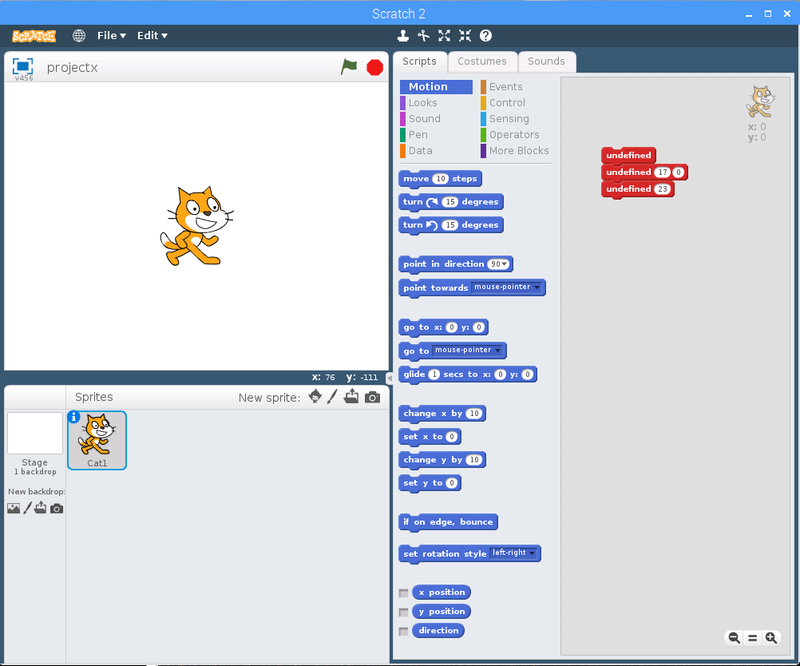 It is based on Scratchx, a version of Scratch 2 that supports Scratch 2 extensions. 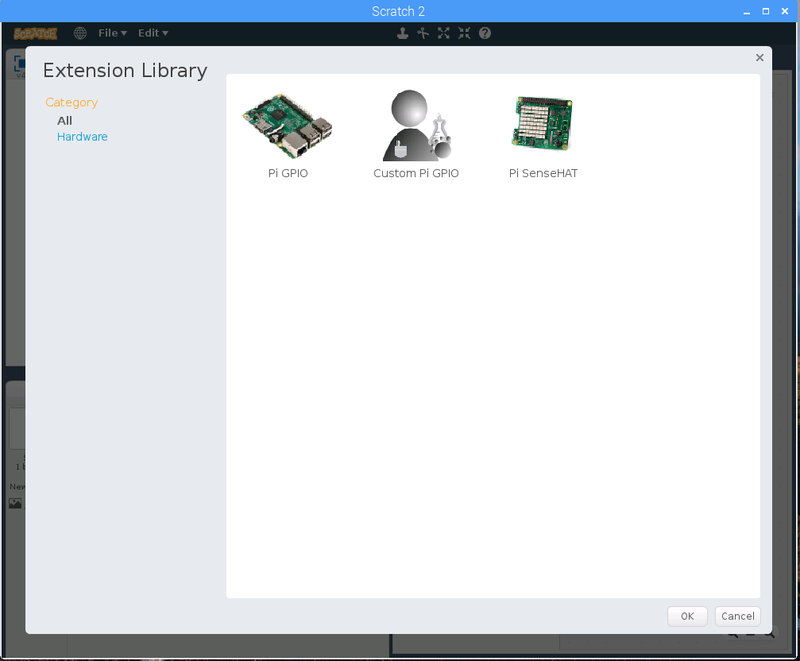 The previous Jessie version of Raspbian is also compatible with s2-pi. This tutorial will show you how to create your own custom extensions. 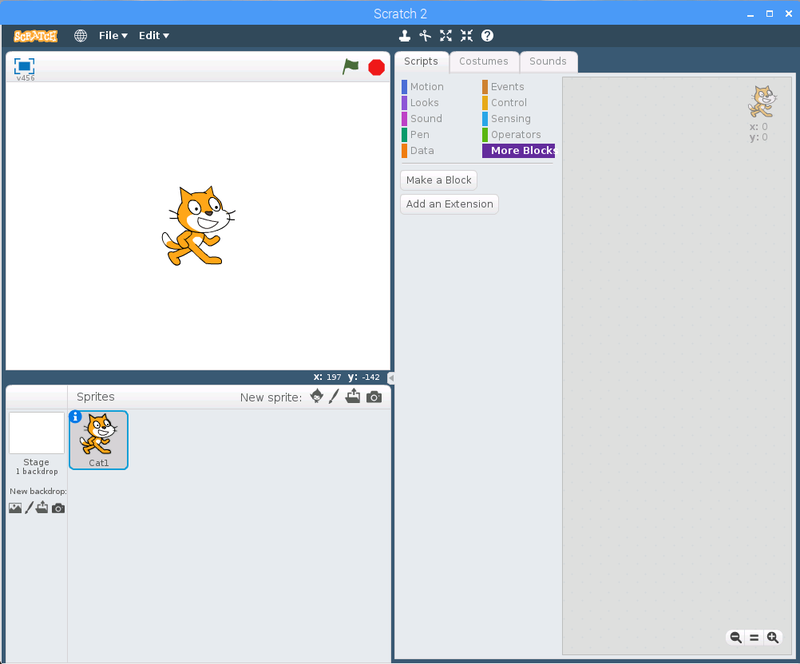 A Scratch extension allows you to create, display and manage your own custom Scratch blocks. 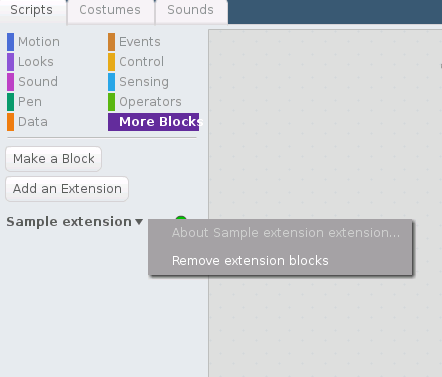 The extension blocks appear in the More Blocks section of the Scratch editor. These blocks, similar to the standard set of Scratch blocks, can optionally contain drop down list menus and/or provide a place for users to enter parameters. In addition, the extension contains the code that implements the block's actions. 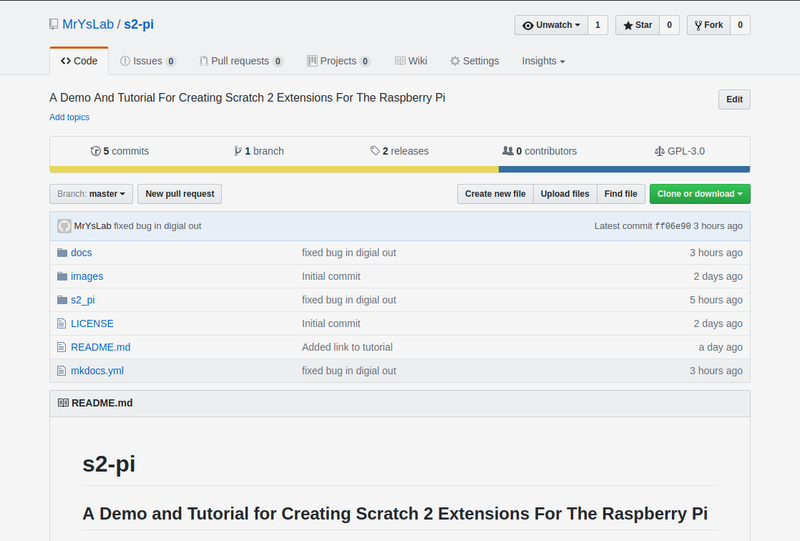 We will be using the s2-pi project to illustrate how an extension is created. The s2-pi project adds blocks to Scratch that allow you control GPIO pins on the Raspberry Pi. The custom Scratch blocks created with s2-pi are shown above. If you are not particularly interested in GPIO control, but would still like to build an extension to meet your own needs, this tutorial will help get you started. Although my interest is in GPIO control, extensions need not be limited to GPIO control. Upon completing this tutorial you should be able to create an extension that can do almost anything you can imagine! Install the s2-pi demo code and its dependencies. 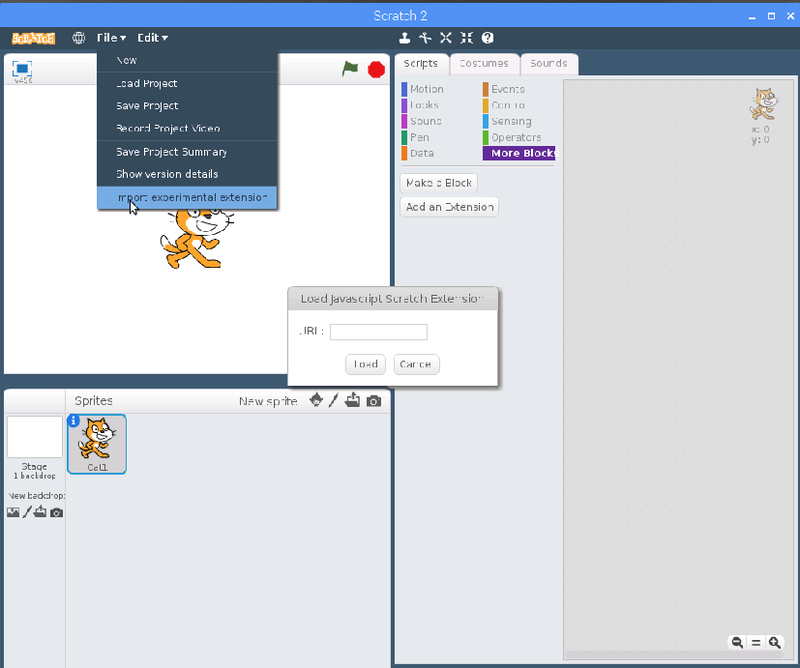 Using the s2-pi code, learn how to create and install custom blocks into Scratch. Create a Python server that will interact with the custom blocks. The server is optional, but implementing a server greatly increases the capability and flexibility of the extension. OK, before heading into the details, let's talk a little bit about what this demo extension actually does. 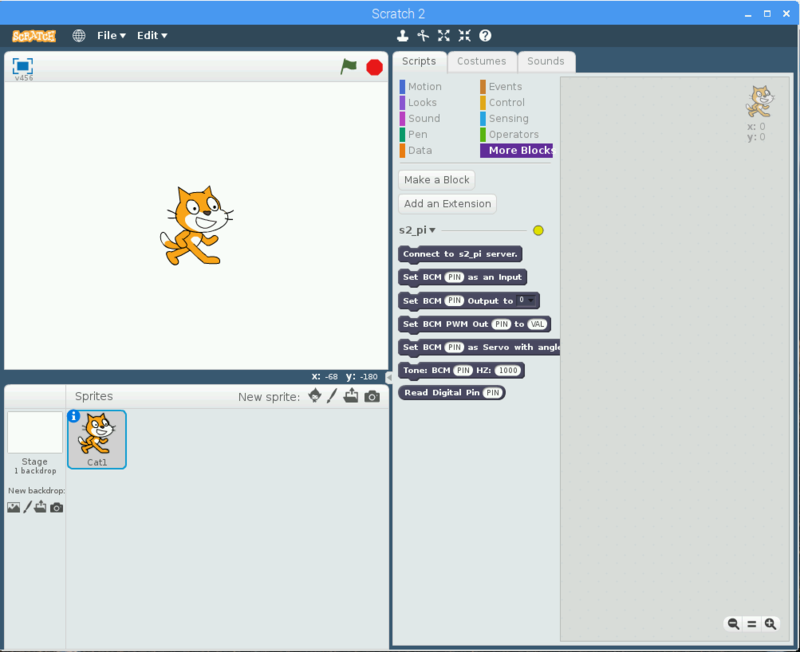 A block that establishes communication between Scratch and a Python server. A block that allows you to set any GPIO pin to a high or low state. A block that allows you to control the output level of any GPIO pin using PWM. A block that allows you to control a servo motor and sets its angle. A block that will generate a tone on any GPIO pin that is connected to a piezo buzzer device. A block that allows you to set any GPIO pin as an output pin. A block that allows you get the current state of any pin that has been set as an output. You can also install s2-pi by downloading the code from Github. Click on the download button on the Github page. Unzip the file. For the purposes of this discussion, the files were extracted into the home directory /home/pi. The screen shot below shows the directory structure after unzipping. Copy the extension file, s2_pi.js into your home directory, making it easy to find. Place a startup executable, s2pi on the executable path that both starts the server and Scratch 2 in one command. Place a file name conversion utility, sbx_to_sb2, on the executable path, to convert Scratch .sbx files to Scratch .sb2 files. 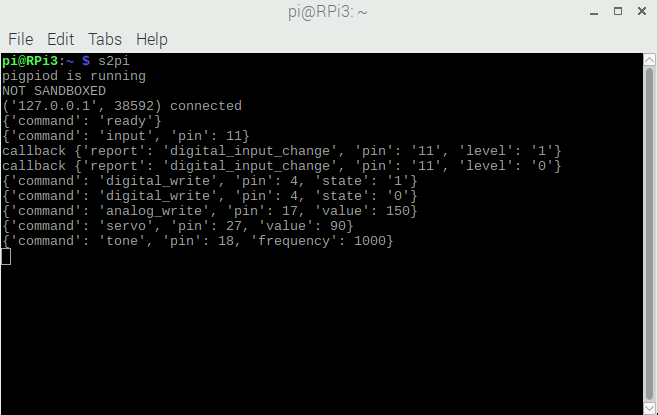 IMPORTANT NOTE: The s2-pi server uses the pigpio library for GPIO pin control. This library is included with the Raspbian distribution, and s2pi will start the pigpiod daemon process automatically. You need only do this procedure once - after executing these two commands, pigpiod will automatically be started each time you boot your Raspberry Pi. Notice this command contains 4 characters without a dash character. This command starts both the server and opens up the Scratch editor. You may see some warnings in the console window generated by Scratch. These can safely be ignored. If when you start s2pi, you see a console message that either psutil or simple-websocket-server have not been found, then you will need to install these packages manually. In your broswer, go to this link, and then click the green download button to download the package. When the download completes, unzip the package. This will create a simple-websocket-server directory containing all the package files. Next, go into the simple-websocket-server directory. You should see a file called setup.py. s2pi should now be able to access these packages. 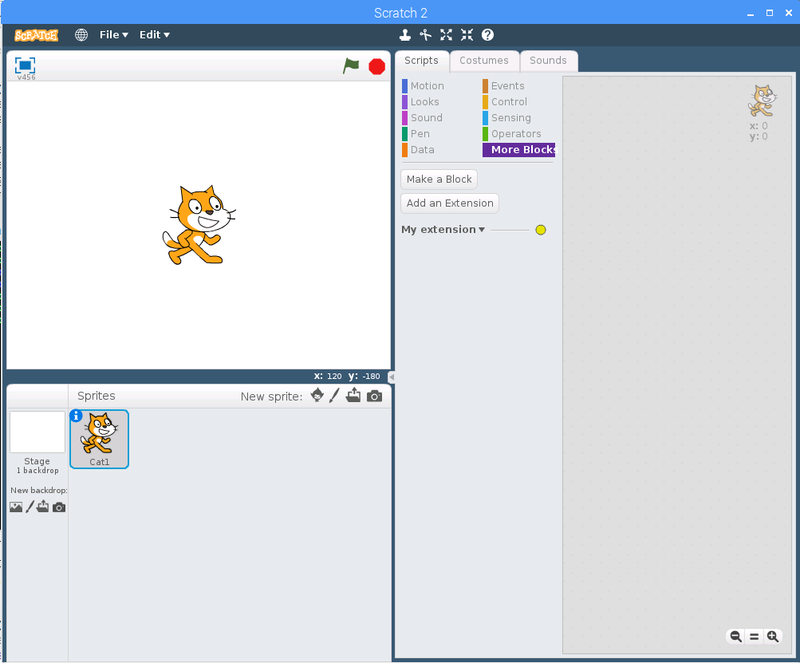 There are 2 possible methods for installing an extension into Scratch. The first method is the simpler method. It is most useful when developing a new extension or trying out an extension for the first time. Once you have finalized your extension design, you may wish to install your extension into the Scratch Extension Library, making it easier for your users to access and use your extension. The Method 2 discussion will explain how this is accomplished. Select the method that best suits your needs. If you click on the More Blocks tab, you should now see the extension blocks appear. If you do not see the blocks appear, check the path and file. If Scratch cannot find the file, it remains silent. Not very friendly. You can also have your extension appear for selection in the More Blocks section by pressing the Add an extension button. 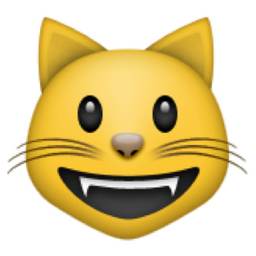 Download a modified copy of /usr/lib/scratch2/scratch_extensions/extensions.json so that our extension is added. Download an icon for our extension into /usr/lib/scratch2/medialibrarythumbnails. We will download these files for the sake of this tutorial. When creating your own extension, you would copy the files directly from your workspace. To have the extension appear in the Extension Library Page, we need to add a line to /usr/lib/scratch2/scratch_extensions/extensions.json describing our extension. The line has already been added to the file we will download, but first, let's take a look at the format of the entry. name - The title that will appear in the Extension Library pagefor our extension. type - This needs to be set to "extension". md5 - This is the name of the icon file we wish to have appear in the Extension library page. url - This is the URL for documentation for the extension. tags - The category that our extension is part of. This needs to be set to "hardware"
We can download a file that already has the additional line added. After starting s2pi, when the Scratch editor appears, go to the More Blocks section of the editor. Click on the Add an Extension button and the Extension Library page will appear. Double click the MisterYsLab icon, and the extension blocks should appear. When developing an extension, you will probably need to reload it multiple times as you add features and get the bugs out. To remove an extension, click on the arrow next to the extension name and select Remove extension blocks. You are now ready to make your changes and to reload the extension. As each custom Scratch block is executed, the terminal window will display the message sent from the extension to the server. 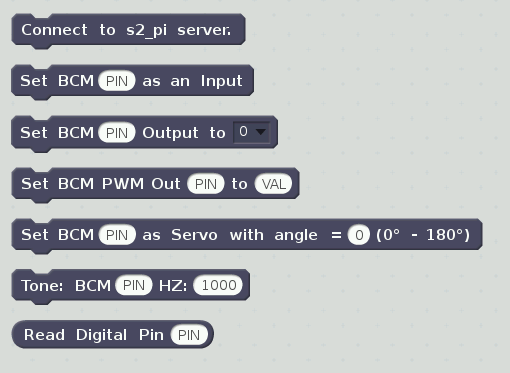 If a pin is set to be a digital input, and the pin changes state, the changes for that pin will also be displayed in the console with the pigpio callback information. The NOT SANDBOXED message is coming from Scratch because we started Scratch from inside a terminal window. This message can be safely ignored. Scratch does not provide a mechanism to automatically connect a communication channel between the extension and the server. Therefore, the Connect to s2-pi server block must be executed before using any of the other blocks. If you forget to do this, an alert will appear on the screen. In addition, the connection indicator will be yellow. When the connection is complete the indicator will go from yellow to green. If you have a device, such as an LED connected to a GPIO pin, you can set its state to a "1" or "0" by using the Set BCM Output block. Using the same LED device, you can set its brightness (from 0 to 255) using the Set BCM PWM Output block. If you have a device, such as a switch, connected to a GPIO pin, you can read the switch's current state. First, you must set the pin as an input using the Set BCM as Input block. This sets up pigpio to provide notification of a state change on the pin. Now to see the current state, use the Read Digital Pin reporter block. If you connect a servo motor to a GPIO pin, you can control its movement between 0 and 180 degrees by using the Set BCM As Servo block. If you connect a Piezo buzzer to a GPIO pin, you can play a short tone by using the Tone block. I would suggest, first starting with the basic boiler plate provided in the specification. Just copy this code into your favorite editor, and save the file with a .js extension. Then load the file into Scratch. You should then see something like this in the Scratch Editor. Remember to select More Blocks or you will not see the custom blocks. In this case, we have not yet defined any blocks, and that is why no blocks appear. Now let's modify the boiler plate slightly to change the indicator from the default green to yellow. Also, we will change the title of the extension from "Sample Extension" to "My Extension". To change the color of the indicator, status was set from a value of 2 to 1, and to change the extension name, the line near the bottom of the file was modified. The specifications for creating different types of blocks, including adding drop down menus and parameter fields within the blocks is nicely documented on the Scratch page, so we won't cover that information in detail here. Let's just take a quick look at the blocks descriptors that s2-pi uses. A block descriptor consists of several fields. The first field describes the shape of the block. Command blocks are created by setting the first fields to " ". A reporter block is created by setting this field to "r". The second field is the text that appears in the block. Within that text, you might include a drop down menu, shown by using %m. The menu contents are defined within the menu section of the block descriptor. You can also have the block provide blanks for the user to input parameters for the block. %n indicates that this parameter will be a number. The third field is the name of the function that will be called when the block executes. You will need to provide the contents of that function within the extension file. The remaining fields provide default values for the parameters defined, if any, in the second descriptor field. Once you have your blocks created and are able to successfully load them into Scratch, it is time to create the code for the block handlers. In this extension, We add a variable, myStatus and initialize it with a value of "1". The _getStatus method, a method that Scratch calls periodically to set the indicator, has been modified. We changed the hard coded value for status to be the myStatus variable. Because myStatus is set to "1" the indicator is initially yellow. We defined a Start The Program block and in the descriptor indicated that this block will be handled by the goGreen function. The goGreen function, called when the block is used in a Scratch script, sets myStatus to "2", which will turn the indicator to green. However, if you wish to start connecting more complicated devices, such as i2c devices, programming may get to be difficult, if not impossible, because of the limitations imposed by Scratch on the extension file. For example, getting the "Pi GPIO" extension to play a tone would be, to say the least, a challenge. 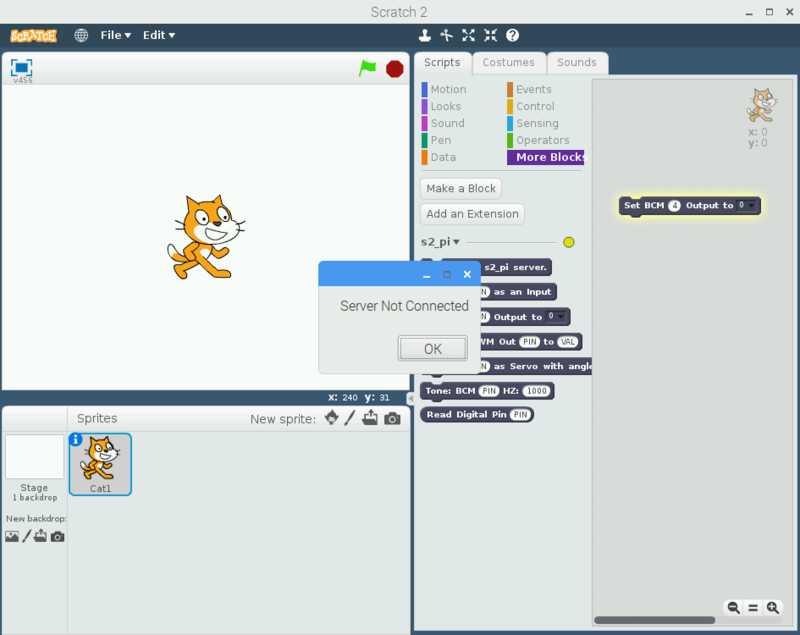 To get around the restrictions imposed by the Scratch editor, we can add a server for flexibility and ease of programming. As mentioned before, you can do all processing within the extension if you wish, but personally, I prefer to "outsource the rough stuff" to another process. For s2-pi, that process is s2_pi.py. The one complication is that we need a way for the Extension and server process to be able to communicate with one another, asynchronously and bi-directionally. Whenever a command extension block is executed, it needs to be able to send the command, in addition to any parameters that may be associated with that command, to the server process. And in the other direction, from the server to the extension, the server needs to be able to notify the extension whenever a reporting event occurs. The communication should be asynchronous in that neither the extension nor the server should need to poll for incoming messages. This makes the system a lot more efficient and easier to program. Not having the need for complicated concurrency schemes is a plus. When a message arrives, it essentially generates an event that triggers the processing of that message. When no messages are available, the program is essentially dormant. WebSockets satisfy all of our communication needs rather nicely, and since it is already built into Scratch, extension implementation is greatly simplified. Unfortunately, none of this is documented by the Scratch team. Don't worry, we will show you how to use WebSockets in the extension. For the server, we just need to create a class that implements the server inherited from a WebSocket library base class. Again, you will be shown how to manage WebSockets on the server side as well. All in all, it is a pretty elegant and simple solution for our communication needs. A WebSocket is defined by Wikipedia as a "a computer communications protocol, providing full-duplex communication channels over a single TCP connection". WebSockets by their nature are event driven, and therefore are a perfect fit for our needs. Similar to an IP socket, one side of the connection acts as the client that initiates the socket, and the other side is the server that accepts connection requests and completes the connection. For s2-pi the extension is the client, and the server is, you guessed it, the server. The WebSocket API requires some methods to be implemented to support the WebSocket event driven protocol. Let's take a look at how s2-pi establishes a WebSocket, and the code it uses to do so. In s2_pi.py, the function near the bottom of the file, run_server, in addition to starting up Scratch, instantiates the WebSocket providing the IP address and port number we wish to use. We also need to pass a reference to our implementation class (S2PI) so that the overwritten methods within S2PI will be called when a WebSocket event occurs. The last line of the method assures that the WebSocket server will run "forever". Once run_server is called, S2PI is waiting for a connection request. When the server receives this connection request, a handshake between both sides ensues, and if the connection is successful, handleConnected is called. On the extension end, a successful connection results in window.socket.onopen being called. Both sides are now ready to send and receive messages. Notice that each of these messages has a command field to identify the type of message. When the server receives a message, it simply dereferences the command field to determine the action to take. On both sides of the interface, we convert the hash/dictionary message structures into strings using JSON, so that message can be carried over the network. When a message is received, we need to reconstruct the string back to the native data structure so that we can easily access all the fields of the message. To convert from a hash to a string on the extension side, the JSON.stringify method is used. The converted message is then sent over the socket using the send function. When the message is received on the server side, it needs to be converted from the string representation back to the native data structure. The handleMessage method in s2_pi.py performs this conversion. Here the string, represented as self.data, is converted back to the data structure by the call to json.loads. The converted string is assigned to the payload variable and can now be manipulated as a standard Python dictionary. For S2PI, the only reporter block is Read Digital Pin. Before using this block in a Scratch script, the Set BCM as an Input block must first be used. 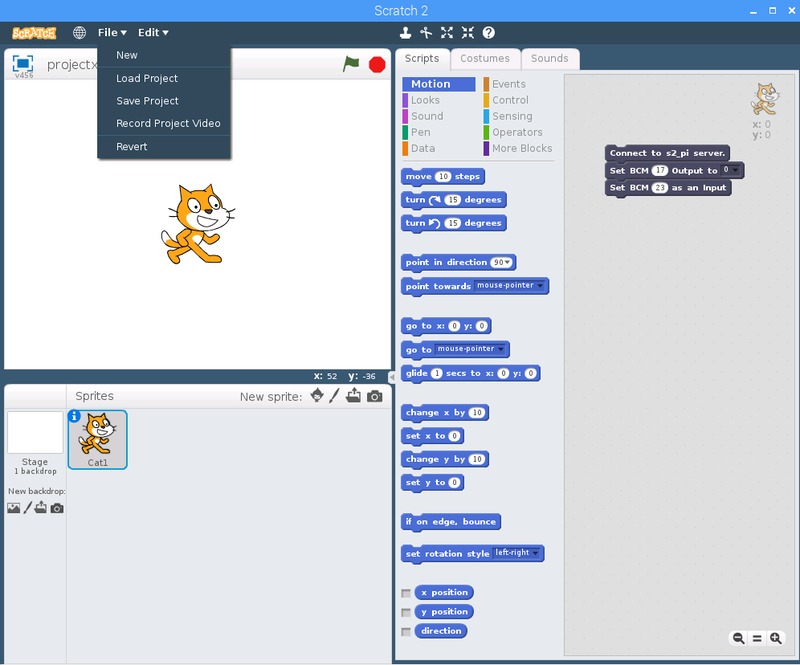 We first make sure that a connection was established, and if not an alert is generated in the Scratch editor. Next, we make sure that the pin specified is valid. The check to do this simply checks the pin is in the range of 0-31. Finally, we create and send a message with a command of "input" supplying the pin number that the user entered in the block. When the server receives this message, the selected GPIO pin is set to be an input pin. Here is the beginning of the server's handleMessage method. The first thing that happens is when a message is received, is that the message is converted back to a dictionary. The message just received was an input command message. The pin number is extracted from the message, converted from its string representation to an integer, and then 3 pigpio calls are made. The first sets a "glitch" value. If using a push button switch, this will debounce the switch. Then the pin is set to be an input pin, and finally, we associate a callback method for pigpio to call whenever there is a state change detected on the pin. When a call back occurs, a message is constructed and sent to the extension notifying it of the state change. The json,dumps call translates the dictionary into a string. The message is then sent with the sendMessage call. The extension receives this message in its onmessage function. Here the message is converted back to a hash by the call to JSON.parse. The report type is checked and the digital_inputs array is modified to reflect the state change. The pin value is converted from its string representation to an integer and is used as an index to store the state change information in the digital_inputs array. When the Read Digital Input reporter block is encountered in a Scratch script, its associated function is called. The current state of the pin associated with this block is retrieved by indexing into the digital_inputs array. After creating your project you can save it by selecting File/Save Project in the Scratch editor menu. This will save your file with a .sbx extension. The current version of the Scratch 2 editor contains a bug. If you go to save a project when using a custom extension (for some reason this bug does not occur if you use one of the two "standard" extensions supplied with the editor), the file is saved with a .sbx extension. When you go to load a previously saved project, .sbx files do not appear in the project choice menu. To get around this, .sbx projects need to be renamed using a .sb2 extension. 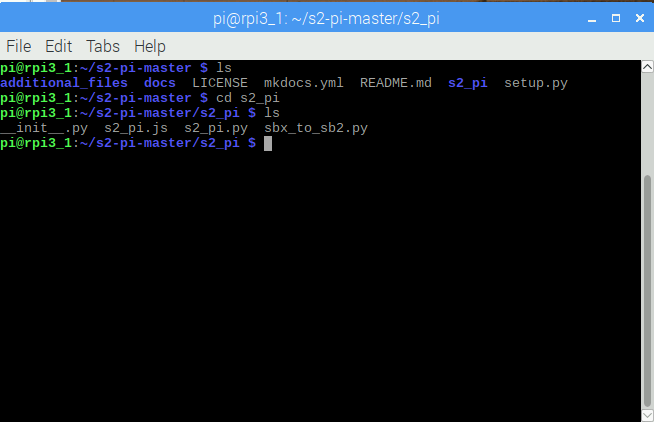 The s2-pi distribution supplies a utility that will rename all .sbx files to .sb2 files for a given directory. To use this utility, open a terminal window and CD into the directory that contains the .sbx project files. If you modify a project that was loaded with the .sb2 extension and then save it, the file will be renamed with the .sbx extension. Hopefully, this rather annoying bug will be fixed in the near future. When you select File/ Load Project, only .sb2 files are shown in the file chooser dialog. Therefore if you saved a project and did not convert its file type, refer to the previous section Saving Your Project, to learn how to convert the file to the correct type. After fixing the file extension type, if you then select File/Load Project, the .sb2 files be available for selection in the file chooser dialog. After doing so, the extension blocks should be restored. Constructing and sending messages, both in the extension and the server. Receiving, deconstructing and processing the message for both the extension and server.